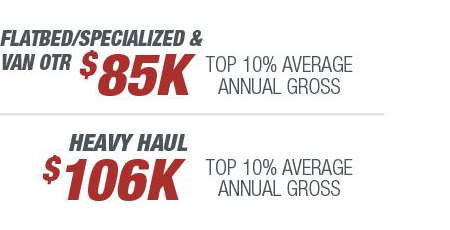 Our Company Drivers earn top-of-the-industry pay. With our NEW Upside Pay program, Company Drivers get CPM or 23 percent of Transportation Revenue. You don't have to pick! You will ALWAYS get what earns you more! Our new program has earned Company Drivers an AVERAGE of $0.65 CPM! Enjoy newer equipment, consistent miles, better home time and the respect you deserve. Plus, get a minimum of $1,000 weekly guaranteed for your first four weeks! NEW! Upside Pay program: 23 percent or CPM - whatever earns YOU more! Our one-year lease program can put you in a truck with no money down and no credit check. PLUS, receive a sign-on bonus up to $3,500! When the year is up, you'll receive a $4,000 completion bonus. That's an extra $7,500 in cash your first year alone!